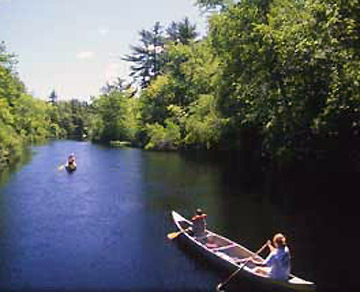 Merrimac sits on the Merrimack river abutting the southeastern border of New Hampshire. Settled by the English in 1638 as a part of Salisbury and later as a part of Amesbury around the village of Merrimacport, it was known throughout the seventeenth and eighteenth centuries as an agricultural and fishing community, with a small amount of shipbuilding. When Amesbury separated from Salisbury in 1666, Merrimac was referred to as the West Parish of Amesbury, or simply West Amesbury, although it was unincorporated.It was incorporated on April 11, 1876, and became a manufacturing center. This town center features brick buildings and Victorian architecture of the late nineteenth century. 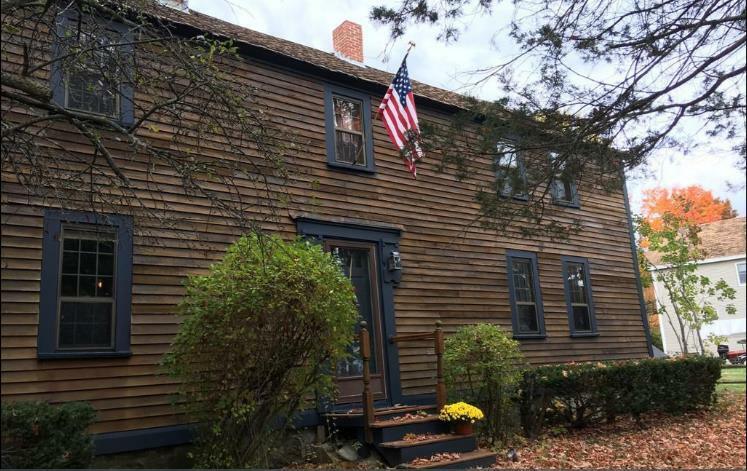 The following list of houses built during the Colonial era is from listings on the MACRIS site, and includes photos from the Merrimac Patriot Properties database. Thanks to Alexander R. Cain for additional information. 33 Church Street. 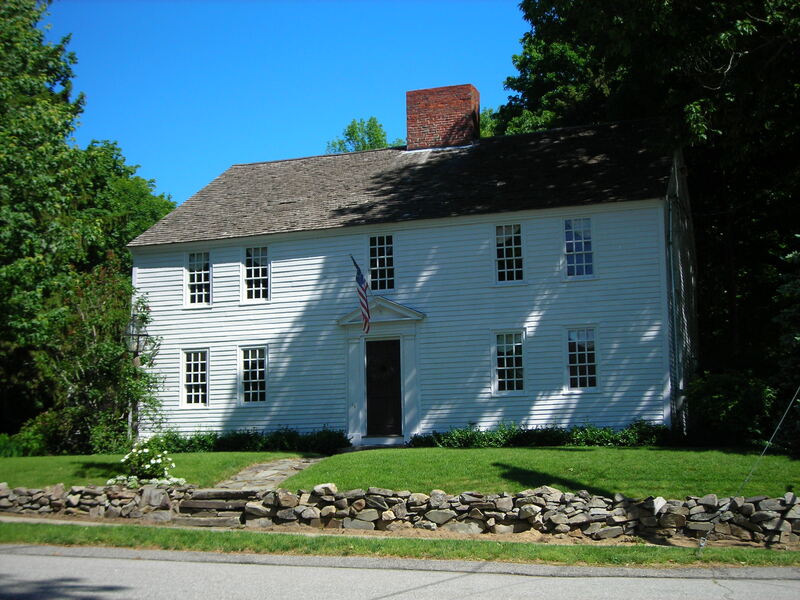 The front of this house dates to the Federal era, but the rear ell shown here dates to 1671 by local tradition. 81 Church Street. The date of construction is not available. Although the MACRIS site lists the date of construction as 1756, the owner has documented it back to 1730 and believes that some of the structural features may suggest a date between 1700-1730. 5 Pine St. The house is said to have been constructed in 1694, but is not listed on the MACRIS site. MER.5, Sawyer, Capt. John House, Locust St, c 1750. 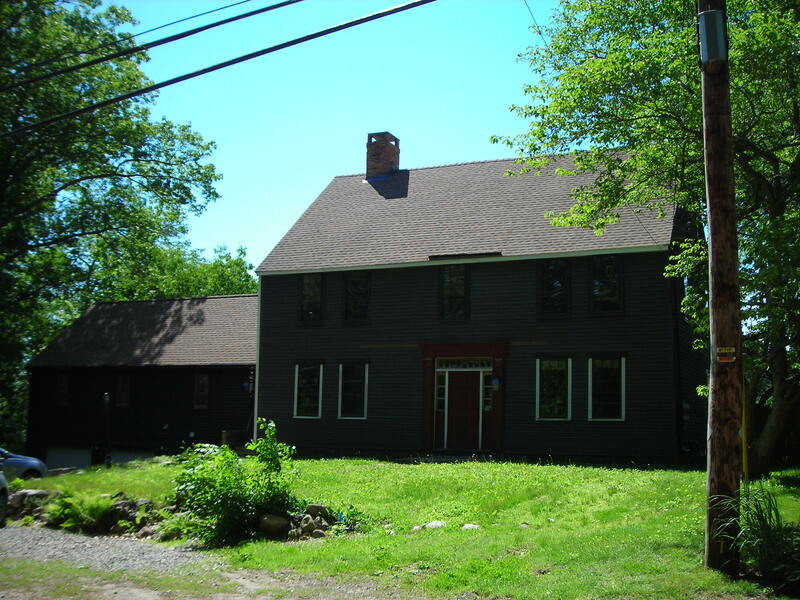 Capt.John Sawyer married Elizabeth Kelly (1727-1794) on April 3,1746 and shortly thereafter built the Sawyer homestead (circa 1750) on”land acquired from Jonathan Clement. This homestead remained in the Sawyer family for approximately 175 years, Addie F. Sawyer (widow of Charles E.) being the last of the direct descendants to live here (1924). MER.1, Kindrick, John House, 59 Locust St, c 1760. On June 11, 1763, John Kindrick purchased 44 acres of land with buildings thereon from Thomas Fowler for 404 jf. In 1?65 John sold 20 acres from the northerly portion of this property to John Sawyer, reserving the remainder “where I now dwell”. On May 28, 1786, John Kindrick II sold his half-share in his father’s estate to his brother Seth, the homestead remaining in the Kendrick family until about 1900. (Over the years the family name Kindrick became Kendrick.) Architecturally this center chimney building is Georgian with four large front rooms (two up, two down), and a kitchen in the rear with smaller bedrooms above. The front entrance hall has a well proportioned three run stairway with early federal wainscoting and railing. Of particular interest is a smoke chamber complete with lug pole and hooks which is observed through a small door half way up the stairs.Examination of the cellar walls reveals them to be constructed of split native field stone. A brick arch, reinforced by a central field stone pier, supports the huge central chimney. The attic shows the roof frame of hewn oak. MER.4, Clement, Jonathan House, 34 River Rd, 1734. This “salt box” was built by Jonathan Clement in 1734. Jonathan was born Jan. 1, 1695, the son of Fawne Clement, who was a prosperous shipbuilder of Newbury. In March 1718, Fawn deeded a large tract of land in Jamaco (200 acres) to his son, – a farm which was bounded “by the Great River” on the south and on the north by “the road to Haverhill”. In 1721, Jonathan married Mary Greenleaf of Newbury. They settled on this farm, first in a small house which was replaced by the present one thirteen years later. 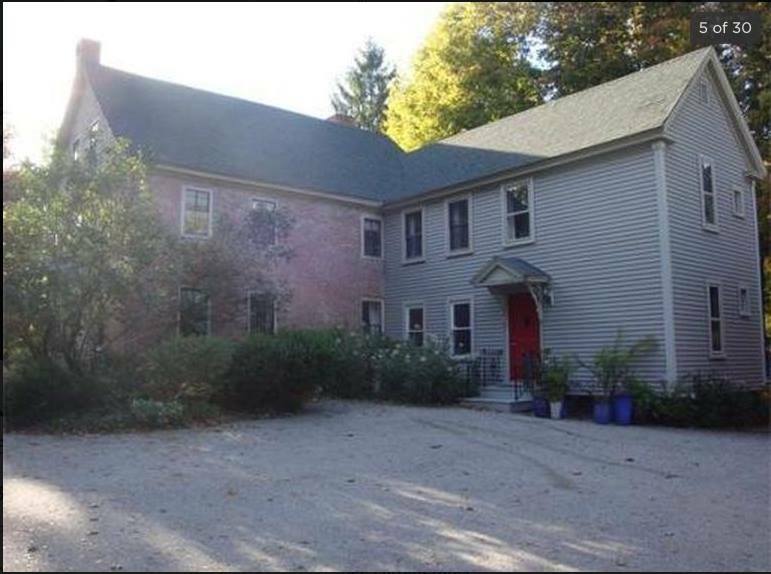 Today this residence sits on an embankment at the foot of Locust St. hill with Its southerly exposure overlooking River Road and the Merrimack River. There is a large central chimney and a six paneled central door surmounted by a triangular pediment. MER.9, Sargent, Stephen House, 60 River Rd, c 1775. One hundred yards west of Jamaco Point on the north side of River Road stands a well-preserved colonial homestead owned prior to 1780 by Stephen Sargent. The home was acquired by Isaac Hughes in 1869 and remained in the same family until sold by Mrs. Bigelow to Milton Smith in 1960. 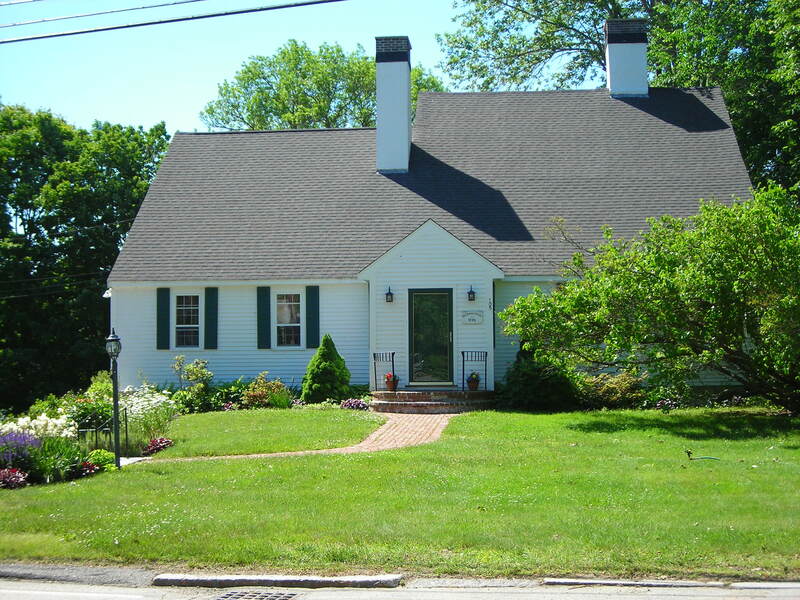 The original house bears the hallmarks of the Georgian period of architecture (1725-1800) including a steeply pitched roof, a center chimney, and a pedimented doorway. In 1936 an old cooper’s shop, originally located at the end of the driveway, was moved into position between the east end of house and west end of barn. This area was converted into a new large kitchen and family room. The latter section was finished off with raised paneling and a ship’s type staircase brought from the Morse house in South Groveland. The interior of this house presents eighteenth century amenities, with wide pine floor boards, six fireplaces, and a beehive oven in the original kitchen. MER.29, Sargent, Josiah House, 98 River Rd, c 1754. The Sargent family was among the first settlers of this river community, and they were fairly prominent in their chosen fields. One branch of the family, headed by Josiah Sargent, settled on the northern side of River Road about 1754, building a home which later was known as the Eastman house, and was located just below the “River Village” store. The house was located originally on 35 acres of farm land. This is probably the oldest house in what was known as the “Sharper’s Corner” area. MER.45, Chase, Dea. James House, 105 River Rd, 1775. 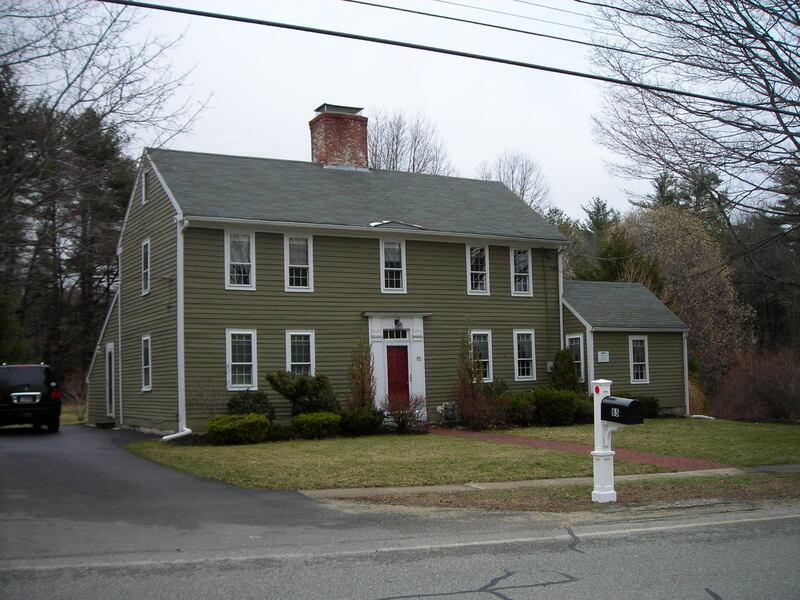 This colonial, saltbox (circa 1775) for many years was occupied by the Chase family who operated the pottery next door. Deacon James Chase (1778-1849) took over the handcrafted pottery business after his uncle, William Pecker (1758-1820) was killed in the collapse of one of his kilns. Following the Deacon’s death, his son, Phineas, (1820-1911) continued the pottery at the same site until 1863 when he sold the land to the South Amesbury Wharf Co. and moved to High Street to his new home and shop. MER.51, Stevens, Dea. Thomas House, 117 River Rd, 1702. This house is one of the oldest in the River Village, being built circa 1702 by Thomas Stevens who was a very prominent citizen in this community. From 1684 to 1724 he served 17 years as a selectman and was twice elected representative from the Town of Amesbury. In March of 1728 he was chosen a deacon of the Second Church of Christ, established two years previously in the West Parish. In 1712 Thomas Stevens, Sr. deeded this property to his son Thomas, Jr. who also became a distinguished citizen, being active during the French and Indian War, serving at Crown Point under Capt. Stephen Sargent (1755) and as a lieutenant in the Lake George campaign (1756). 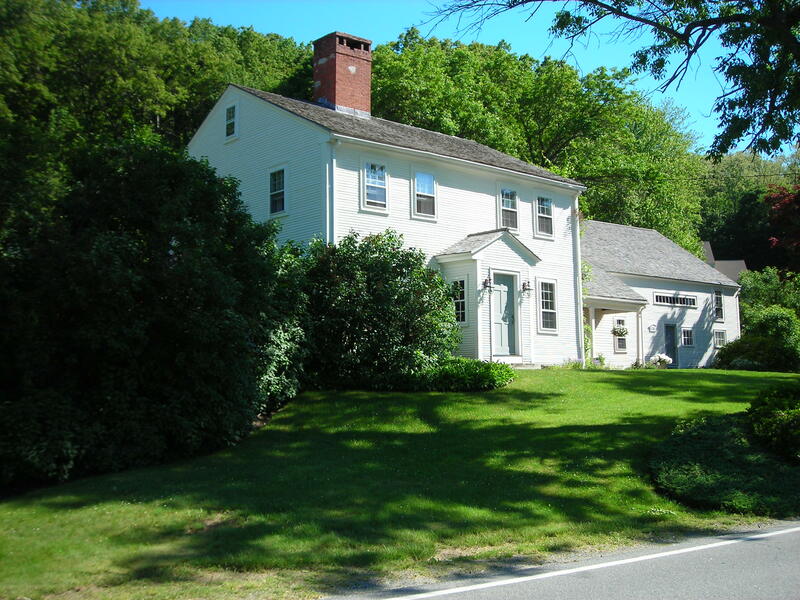 This house is architecturally significant and scenically located at the confluence of the Merrimack River and Cobbler’s Brook (Patten’s or Sargent’s Creek). It was here that the old bridge crossed the brook to Clapboard Landing, for many years an important local shipping center for river traffic. 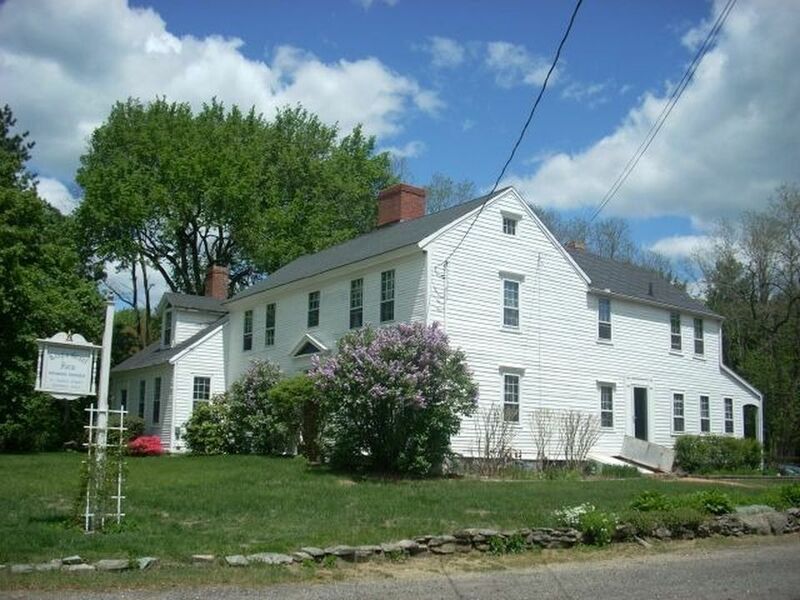 This colonial house has a central front door and a central hallway. Two chimneys originally accommodated fireplaces in each of the eight rooms, four of which remain functioning today. The windows are symmetrically placed, multi-paned 9/6 both upstairs and down. Within, the fireplace walls are paneled; there are gunstock corner posts, wainscoting, and pine flooring. One unusual feature is the brick noggin in the outside walls throughout the house. 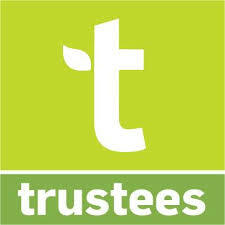 The MA Historical Commission does not list any historic houses on either of those roads, but their list is incomplete. Please reply with the street addresses. 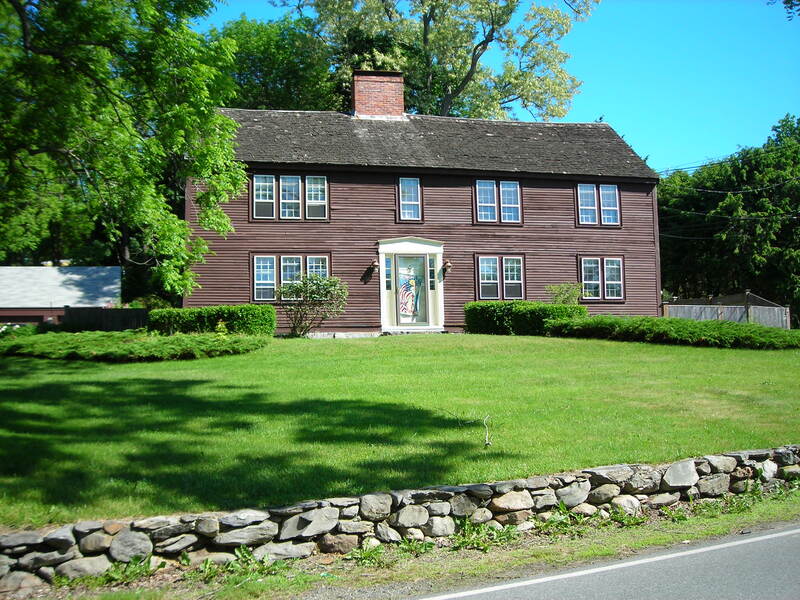 There is a First Period Davis house on Merrimac Rd in Haverhill but I can’t find a listing for a Heath house at all.